Successfully Added 5W LED Spotlight - GU10 Fitting, Dimmable, 5x 1W LED, 500 Lumen, 3000K, 30000 Hours, 25 Degree Beam to your Shopping Cart. 4 Dimmable 5W LED spotlights to make the best replacement for those old GU10 halogen bulbs by offering the same light at a fraction of the cost. Change your inefficient GU10 halogen bulbs, popular with spotlighting for display cabinets feature lighting and work tops into energy efficient LED spotlights and enjoy the same level of lighting without the heat and costly energy bills associated with halogen spotlights. With 500 lumens of light these 5 Watt LED lights compare to a 40 Watt bulb with brightness but consume just a fraction of the energy as they output very little heat and are considerably more efficient. Each of these lens covered bulbs features five LEDs and offers around light across a 25 degree angle, they are ideal for use in commercial, retail or domestic installations. Compatible with GU10 light fittings using an AC220 voltage these LED spotlights have an expected life of 30000 hours, more than 10 times the average halogen lamp. This means you can go years without having to change a spotlight. Being dimmable these lights are ideally suited to a range of uses and run at a fraction of the heat of their halogen counterparts with a greatly reduced energy demand that will save you a small fortune in electric bills. 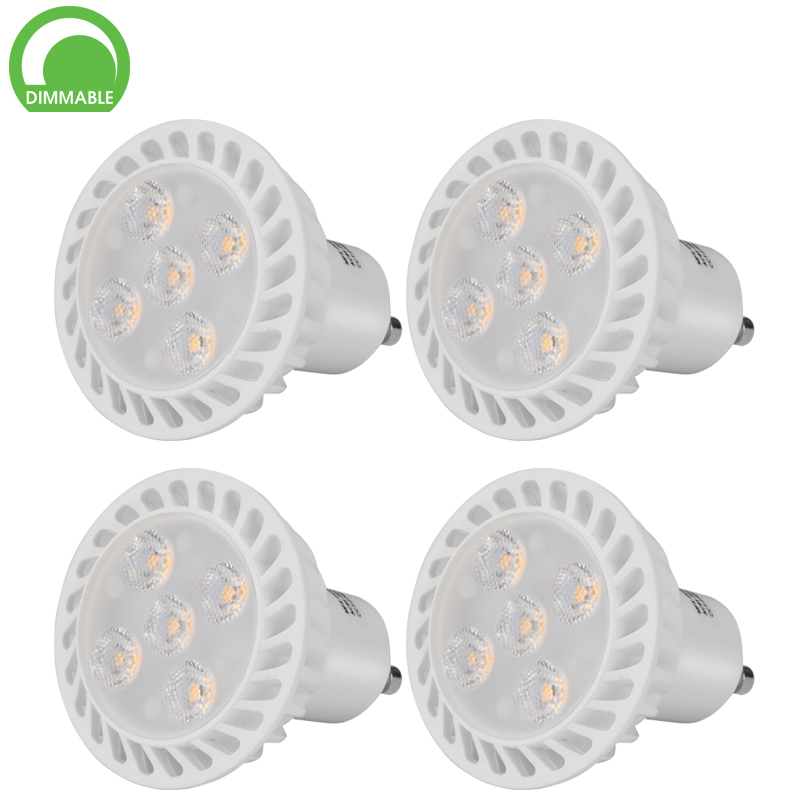 This pack of 4 dimmable GU10 LED spotlights comes with a 12 months warranty, brought to you by the leader in electronic devices as well as wholesale LED spotlights..